Maybe cooking up a meal from the tropics will make it start feeling warmer here in New England. I sure hope so. Last weekend I finally uncovered the grill, but I needed to layer up to be out tending to the meal. OK, the snow has melted, so I can’t complain too much. Tropical food is the theme for this week’s #SundaySupper, hosted by Cindy at Cindy’s Recipes and Writings and Marlene at Nosh My Way. I had to join in, hoping to usher in some warmth, plus it gave me a chance to update my Grilled Swordfish with Pineapple Salsa recipe. I’m a big fan of fruit salsas on fish–for instance, I served up Salmon with Mango Salsa for a #SundaySupper past. But you can really kick up the tropical flavors by grilling the pineapple for the salsa alongside a nice piece of swordfish. Now, if it were only balmy out there as I grilled it up…wait, wasn’t going to grumble about the weather more! Swordfish is one of my favorite things to grill. It’s nice and meaty, so it holds up well to grilling. Done right (i.e. not overcooked) the fish and nice and tender, yet substantial. 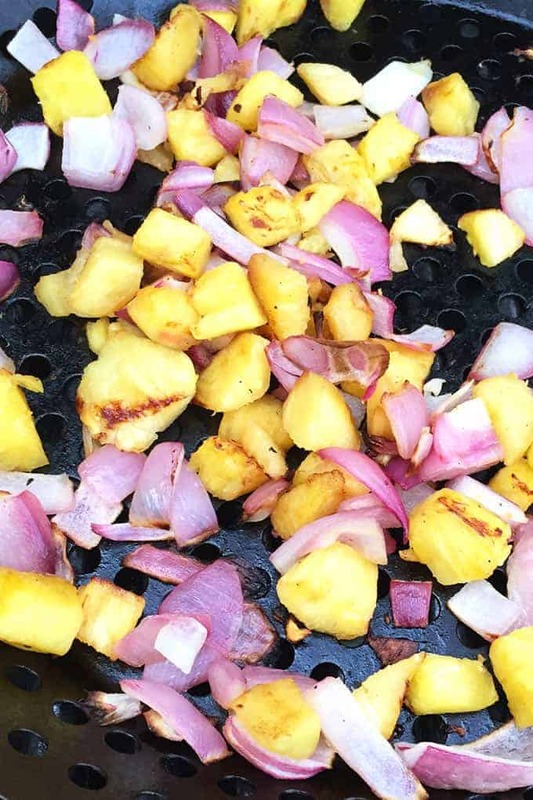 Topped off with this grilled pineapple salsa, and you have yourself an awesome meal! At first, I wasn’t sure if swordfish fit the tropical theme perfectly. I know boats from local waters go off in search of swordfish–sometimes it doesn’t work too well, as you know if you’ve read or seen The Perfect Storm. But then I recalled another book, The Old Man and the Sea, and thought the protagonist might have been going after swordfish. 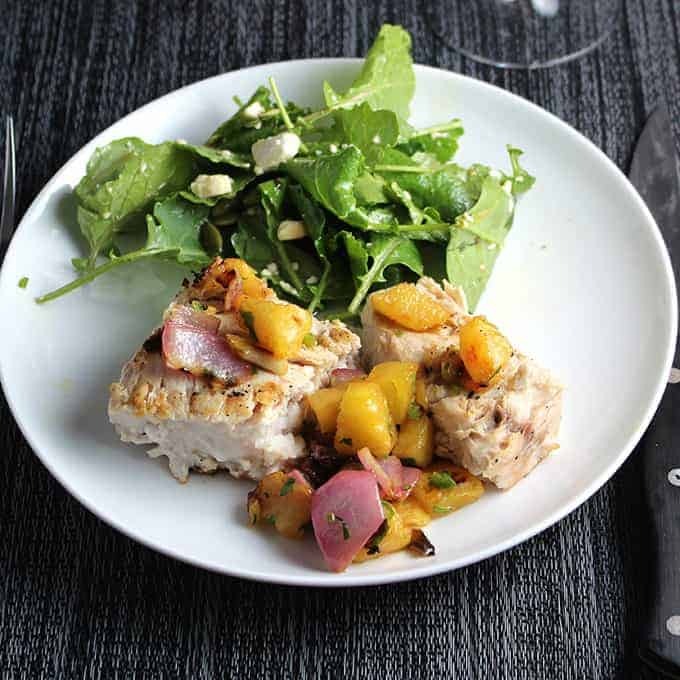 A quick search confirmed that swordfish are found in tropical waters, confirming that my grilled swordfish with pineapple salsa is a solid offering for the tropical #SundaySupper! You can buy pineapple already chopped, but I like to core my own. As you can see in the photo, coring pineapple: you basically twist the top off, chop off both ends, then start cutting off the sides to reveal the fruit. Cut the fruit off around the core, and chop into the one inch pieces called for by the recipe. 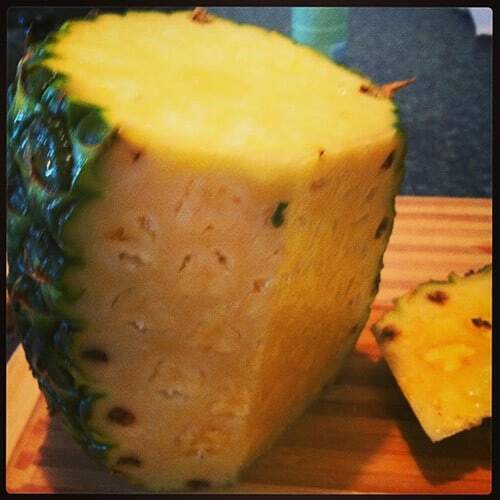 A whole pineapple will give you the two cups called for here plus extra pineapple for healthy snacking! My other method note for this recipe is that a grill pan makes a big difference preparing the salsa. You can cut the onion into the size pieces needed for the salsa, and grill them without worrying about them slipping into the grill. 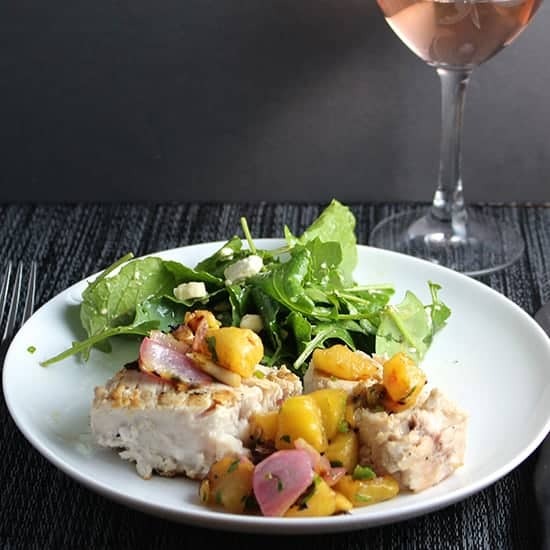 Wine Pairing: What wine to serve with this swordfish and tropical salsa? A rosé certainly is a good way to go, in keeping with the season and to match both the fish and the salsa. Medium-bodied with some subtlety is ideal, and we had a rosé from Provence that fit the bill nicely, a blend of Grenache, Cinsault, Mourvèdre and Syrah. 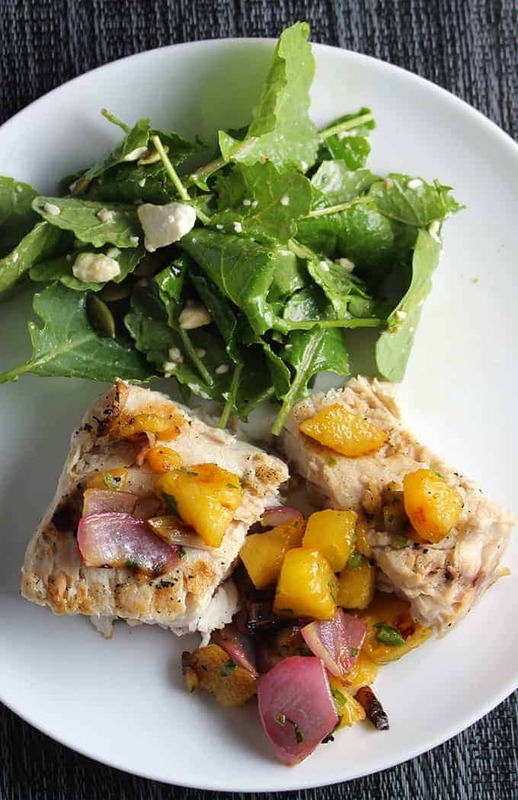 Grilled swordfish with pineapple salsa is a great way to enjoy seafood from the grill. The pineapple and onions get grilled along with the fish to enhance the flavor of the salsa. Combine the orange juice and soy sauce in a small pan. Bring to a boil, then lower heat to gently simmer for about 10 minutes, until the liquid is roughly reduce by one half. Set aside when finished simmering. Combine the pineapple and onion in a mixing bowl. Toss with 1 tablespoon of the olive oil, add a bit of salt and pepper to taste. Spread the onion and pineapple mixture out in a grill pan (you need something to keep the pieces from slipping through into the grill). Place on the grill. Grill the onions and pineapple for 10 to 15 minutes, stirring occasionally. When the pineapple is starting to brown and the onion is getting soft, remove from heat. Scoop the grilled pineapple and onion back into the mixing bowl. Stir in the remaining tablespoon of olive oil, the jalapeno pepper, parsley and lime juice. Add salt and pepper to taste and set aside. You can start grilling the swordfish after getting the pineapple grilling. Coat the swordfish with a bit of cooking spray, then place on the grill. Brush the side facing up with the orange juice mixture. Grill the swordfish with the grill covered on for 6 minutes. Flip the fish to the other side, and brush the side now facing up with the orange juice. Grill another 6 minutes, and check for doneness. You want the fish to be just cooked through (all white) but still moist. This typically takes 12 to 15 minutes of total grilling time depending on the thickness of the fish. When the swordfish is cooked through, move to a platter. Portion up the fish, and serve topped with the pineapple salsa. Enjoy! Be sure to check out all the tasty tropical dishes served up by the #SundaySupper crew! Grilled pineapple really kicks this up a notch! Yum! I love grilling swordfish too! Great topping with that pineapple salsa. Love the flavor combinations here and I bet they taste fantastic with the grilled Swordfish!Lovely recipe! I love that you grilled the pineapple and onions along with the swordfish, David. Beautiful flavors! I always core my own pineapple too. It’s not too hard. Love swordfish and I bet the pineapple pairs super with it. I agree, Laura, once you get in the habit of coring your own pineapple it’s not too hard. I love grilled swordfish too and the pineapple salsa is the perfect topping for it. Thanks Wendy, it works nicely! Such a lovely plate of food! Both your swordfish and salsa sound terrific! Yes, and light enough to leave room for dessert! Looks wonderfully delicious and healthy! What a gorgeous, light Sunday Supper! I, too, enjoy cutting my own pineapple. Love all your flavors here. This is totally up my alley. I’ll eat pineapple salsa with just about anything, but grilled swordfish just sounds absolutely perfect. I think swordfish was a great choice. You don’t see enough recipes for it. The sweetness of the pineapple salsa will marry so nicely with the meatiness of the fish. Thanks Christie, I sure enjoy coming up with swordfish recipes! Loving this pineapple salsa! Isn’t it so fun to play around with salsa’s! I love grilled salsas! Grilling them adds such oomph to the flavor. Paired with the meaty swordfish, this definitely sounds like a meal from the tropics to me! Ohh I haven’t had swordfish in forever!! This sounds wonderful! What a great looking dish David! I too love grilling swordfish. The grilled pineapple salad is a nice touch. I’m sure this is delightful with Rose!